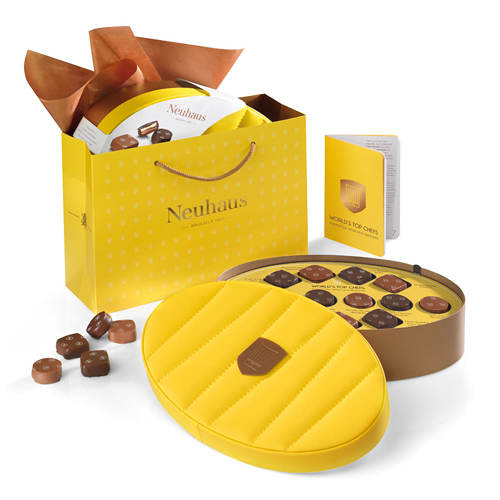 Nine world-famous Chefs and Chefs Pâtissiers have created their own unique pralines for Neuhaus, each one inspired by a treasured childhood memory. This prestigious combination of haute cuisine and premium chocolate will delight the finest palate. 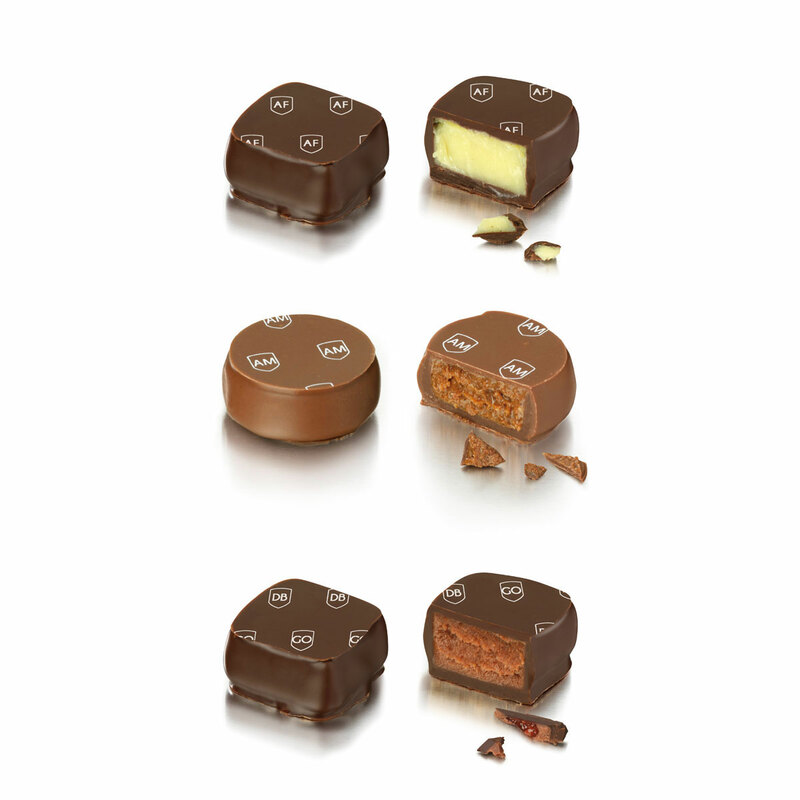 Discover the combination of fresh flavours including almonds, hazelnuts, coconut, speculoos, lemon, green tea, coffee, and strawberry are the perfect complement to the intense Belgian dark chocolate and rich milk chocolate. Christophe Adam of Paris based his praline on California almonds and coconut nibs from Bali, Belgian Chef Joost Arijs was inspired by flavours of speculoos and mandarins from childhood Saint Nicholas Day chocolates, and Annie Féolde of Italy honoured the flavours of Tuscany in her extra virgin olive oil and lemon zest ganache. 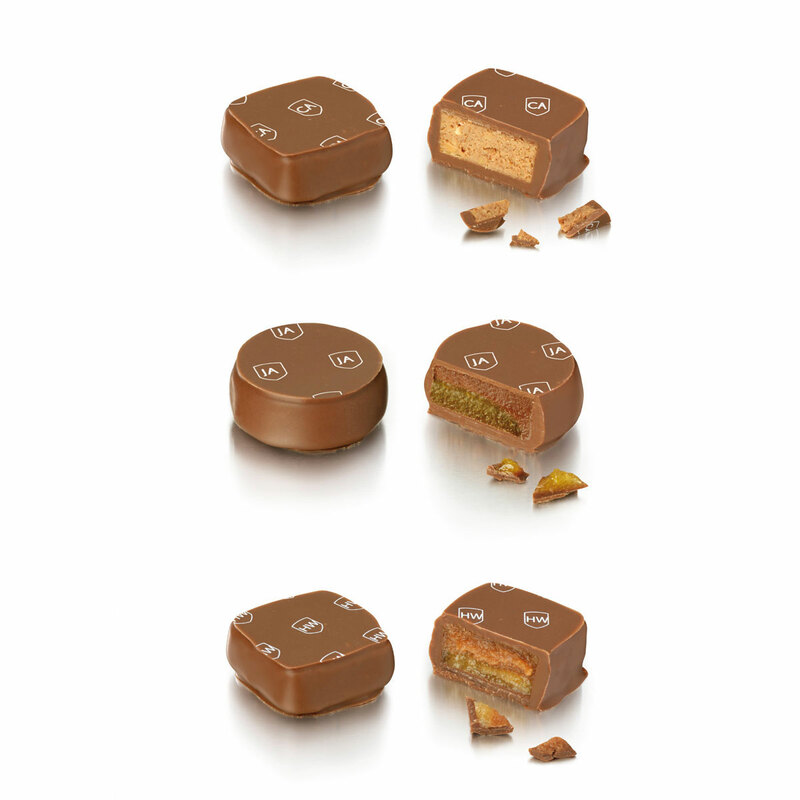 Click on the "Composition" tab for more information on all the praline flavours. 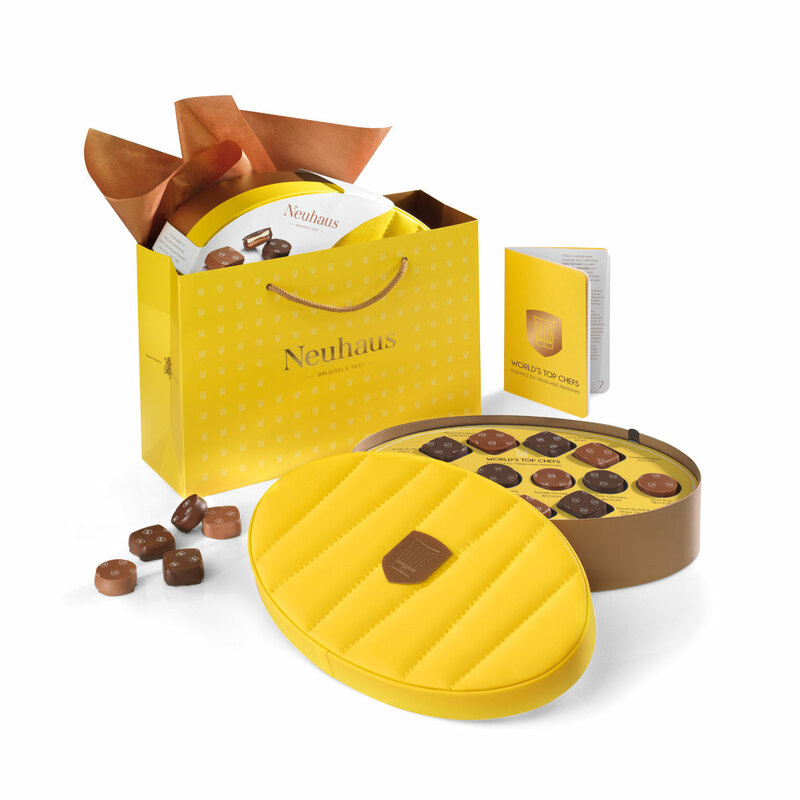 This luxury gift box contains 27 exclusive chocolates (three from each chef) in an exquisite presentation. A smooth praliné made with Californian almonds, set on a crumble of caramelized coconut nibs from Bali and covered in creamy milk chocolate. Velvety-soft single-origin milk chocolate ganache, made with 44% cocoa from Arriba, together with Belgian speculoos on a Spanish mandarin coulis. Crispy praliné with popping sugar on a layer of fresh fruit coulis made from yuzu, an Asian citrus fruit, covered in intense dark chocolate. Chocolate ganache scented with lemon verbena, on a delicate layer of strawberry fruit jam coated with dark chocolate. 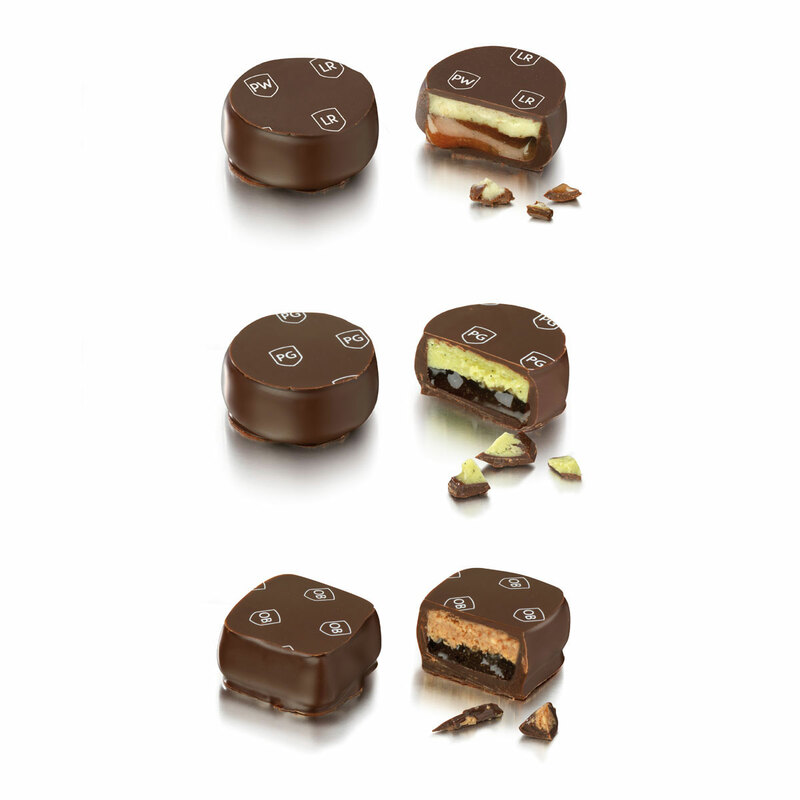 White chocolate-based creamy ganache, enriched with Italian olive oil and masterfully combined with lemon zest. Smooth vanilla ganache with Japanese Matcha tea on a fresh gel of tonic, covered in intense dark chocolate. A ganache of pumpkin and Eastern ginger on a layer of marzipan with 50% almonds from Faro in Portugal and orange zest, covered in soft milk chocolate. Smooth Madagascar vanilla fresh cream on a layer of caramel, with pineapple and exotic black Samba tea, enrobed with intense dark chocolate.